Off the beaten path in Bella Vista, Arkansas, below the Windsor Lake Dam with the entrance being off Highway 340/Lanshire Blvd less then a mile west of Town Center, is the beautiful Tanyard Creek Trail. Built by the sweat of thousands of Volunteer hours and financed by thousands of donated dollars, the Tanyard Creek Trail is a beautiful walk through the natural world of Northwest Arkansas. Arkansas's state motto is "The Natural State" and for good reason. Arkansas attract many visitors to our wild places and native beauty. People from all over drive hours, often just for a weekend, to hike the Ozark hills and mountains, enjoy the wildlife and the fresh air of Arkansas. Incorporating the path of a very old country road and the meanderings of Tanyard Creek, the trail loops lazily up hills and down with long stretches of straight-aways. Most of the trail takes you through 2nd growth Oak/Hickory forest, with some of the trails skirting meadow lands. The beautiful waterfall created by run off of Windsor lake is a favorite resting place with a well placed bench and fenced concrete viewing area. Rapids created by the falls present a wonderful recreation area for more daring adults and children alike who don't mind getting a bit wet. Signs of wildlife abound if you care to look for them and the deeper pockets of the creek are full of fish of all sizes. Snakes are a common site in the creek (and sometimes sunning themselves beside the paths) but are mostly harmless and not a threat if they are left alone. Contrary to popular belief, water moccasins are not a common snake in Northwest Arkansas and nearly all the snakes you will see in the creek is the harmless midland water snake or another harmless water snake species. Sturdy shoes are definitely recommended. The trailhead beings with a wide concrete walk, but this ends when you reach the trail map pictured at the top of the page. The rest of the trail is either wood chipped or natural ground. You'll find many bridged creek crossings, a few that can be crossed using rock stepping stones if you'd rather by-pass the bridge. The length of the trail if walking the regular loop is .8 miles. You can, however, take the longer route stretching out the length of your hike by at least 15 minutes. There is also the meadow dam trail that will add a considerable distance to your hike. For those wanting a real workout, try walking the grassy dam trail to the top of the dam, circle the dam, visit Lake Windsor, and then come back down. The trail is dog friendly, and even has a dog watering fountain at the beginning of the trail. Dogs must be leashed at all times and it's a good idea to bring a plastic bag in case your dog should feel the call of nature. I've found that the yellow sleeves that newspapers come wrapped in, along with a plastic Wal-Mart bag, make a great pet "clean up" kit. Cleaning up after your dog will be greatly appreciated by those using the trail behind you. Scores of trail signs identify important places, trees and plants along the way. There are numerous benches placed along the trail for just sitting and reflecting, or resting if the need should arise. Bring a camera, as the opportunity for photos abound. During the week you may find you have much of the trail to yourself. On weekends, however, be prepared to share the beauty with many visitors, especially on Holiday weekends (pictures below were taken on a Saturday of Memorial day weekend)! It's a large winding trail, though, with plenty of room for everyone! 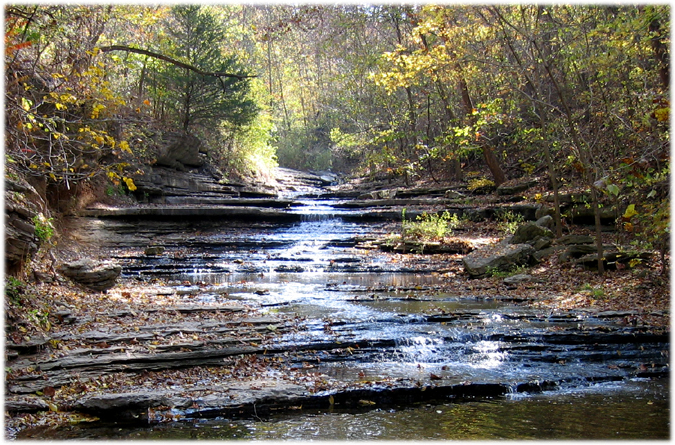 To get to Tanyard Creek Nature Trail from HWY 71 take HWY 340 (Town Center Exit) west. Watch for the lake Windsor Dam on your left. Below the dam, turn left on Westford Lane and right into the parking lot. The trail leads off from the Pavilion to the right. I've taken a number of high resolution images so sit back and enjoy your online visit to Tanyard Creek Trail in Beautiful Bella Vista Arkansas!